The shortest international regular air route covers a distance of 21 kilometers, with an official duration of the flight of 20 minutes, although it takes only eight minutes to travel the distance between the two cities. 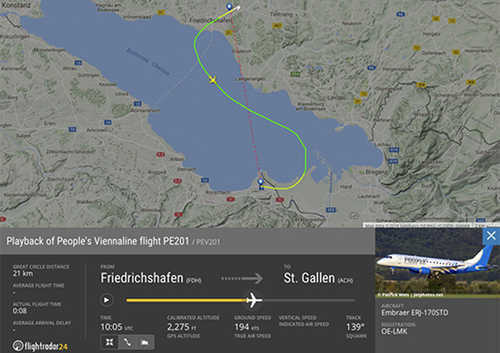 the flight, from San Galo / Altenrhein in Switzerland to Friedrichshafen in Germany crossed the Austrian border and it is actually the first stretch of a route that continues Cologne (Germany). Some other crazy routes are described at Fronteras Blog. The numbering names the track corresponds to its orientation to magnetic north (the direction given by the compass). Parallel lines in the end of the runway usable indicate the width of the track. Four bars means that the track is about 18 meters wide and 8 bars example -case warn that the track is 30 meters wide. A series of thick, short lines placed at each side of the runway center provide guidance (approximately) the pilot to touch the runway on landing.